Growing up, we usually had meals which featured a protein, a starch, and a vegetable. I usually liked the protein and starch well enough but, like most kids, I stayed away from the vegetables. At that point, I was what would could only kindly be described as a picky eater. The list of vegetables I’d eat was pretty limited. It didn’t help that about the only vegetable we ever seemed to eat was canned green beans. I’ve gotten better about vegetables but I’m still significantly vegetable challenged. I like them enough but it’s rather frequent where I’m making dinner and can only muster enough effort for a protein and starch. To compound the problem, I don’t have that many different recipes for vegetables that I like. Vegetables must be cooked well for me to like them. I don’t remember when I first started making this recipe. It was awhile ago. It’s pretty simple and doesn’t require a whole lot of effort. It’s easy to make along with something else. 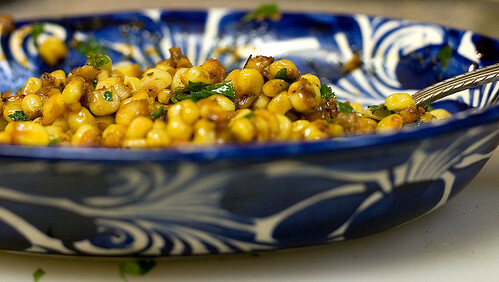 It also has strong flavors that go well with spicy foods. This time I tried something different: I used the Creole Seasoning recipe from the cookbook. In the past, I just used some Zatarain’s Creole Seasoning that I had purchased at some point in time. I suppose it might make me a bad person to use a premixed seasoning but it was easy and it was there. I figured using a homemade spice blend would clearly be superior to the premixed variety. But I was wrong, sort of. The two different spice blends yield very different results. The Zatarain’s is spicier and saltier. The homemade spice blend has a smoky flavor and has the savory flavor of the herbs. I prefer the homemade spice blend but Angela liked the Zatarain’s. It’s still up in the air which I’ll use in the future. Most likely, I’ll use each at different times depending on what we’re eating it with. Melt the butter in a medium sauce pan over medium heat. 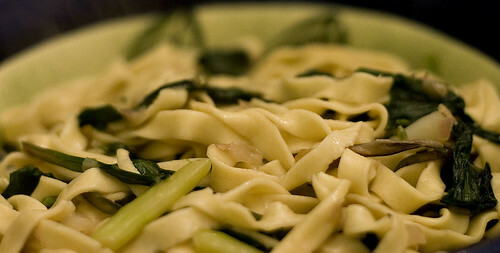 When the butter has stopped foaming, add the garlic and sauté until golden, about 3 minutes. 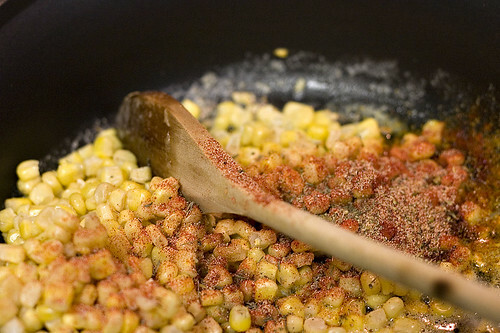 Add the corn to the sauce pan and mix well. Add the Creole Seasoning and season with salt to taste. Cook over medium heat for about 5 minutes to allow the corn to heat through. Remove the sauce pan from the heat and stir in the parsley. Mix together all ingredients and place in a sealable container.